(Nanowerk News) In the world of single atoms and molecules governed by chaotic fluctuations, is the spontaneous formation of Turing patterns possible - the same ones that are responsible for the irregular yet periodic shapes of the stripes on zebras' bodies? A Polish-Danish team of physicists has for the first time demonstrated that such a process can not only occur, but can also be used for potentially very interesting applications (Journal of Chemical Physics, "Nanoscale Turing structures"). Everyone is familiar with a zebra's stripes, but not everyone knows that these are the manifestations of chemical reactions taking place according to a process first described by the famous British mathematician Alan Turing, the creator of the basics of today's computer science. Turing patterns, most commonly displayed in chemistry as periodic changes in the concentration of chemical substances, have hitherto only been observed in dimensions of microns or larger. It seemed that on a smaller scale - at the nanoscale, where random fluctuations rule the movement of single atoms and molecules - these patterns do not have the right to form spontaneously. "So far, no-one has even studied the possibility of the formation of Turing patterns by single atoms or molecules. However, our results show that Turing nanostructures may exist. And since this is the case, we will be able to find very specific applications for them in nanotechnology and materials science," says Dr. Bogdan Nowakowski from the Institute of Physical Chemistry of the Polish Academy of Sciences (IPC PAS) in Warsaw, one of the physicists in the Polish-Danish team that has recently conducted computer simulations and theoretical analyses on Turing nanostructures. Turing patterns occur in dynamic systems far from a state of equilibrium. Under the appropriate conditions there may then be a feedback mechanism: chemical reactions taking place may influence the concentration of their own components, which in turn may change the course of the reaction itself. The process leads to the formation of periodic, but not necessarily monotonously regular patterns. In nature, these patterns play an important role, particularly in the formation of young organisms (morphogenesis). For example, in the initial phases of the development of vertebrate embryos, this is how periodic segments, somites, are formed in the dorsal mesoderm, which are later converted into, among others, vertebrae, components of the spine. "In our studies we considered very simple reactions of two model substances with different rates of diffusion. Computer simulations carried out using molecular dynamics, in collaboration with Dr. Jesper Hansen from the Danish University of Roskilde, gave rise to a very interesting picture," says Dr. Piotr Dziekan (IPC PAS). Clear and permanent patterns formed spontaneously in the simulated systems (of nanometer dimensions) - periodic changes in the density of molecules, which remained stable despite the destructive influence of fluctuations. It turned out that one cycle of concentration changes within the Turing pattern could appear on a length of just 20 molecules. For Turing nanostructures to be formed, chemical reactions satisfying certain conditions have to take place between the chemical substances. This requirement severely reduces the number of compounds that can participate in the process and, consequently, severely limits the potential applications. However, the simulations carried out by the Polish-Danish team suggest that Turing nanostructures can quite easily be transferred to other compounds, not participating directly in the main reaction. "Turing nanostructures can only arise with carefully selected chemical substances. Fortunately, the pattern formed by them can be 'imprinted' in the concentration of other chemical compounds. For the pattern to be copied, these compounds must fulfill only two simple conditions: they must bind to one of the reactants of the main reaction and diffuse slowly," explains Dr. Dziekan. 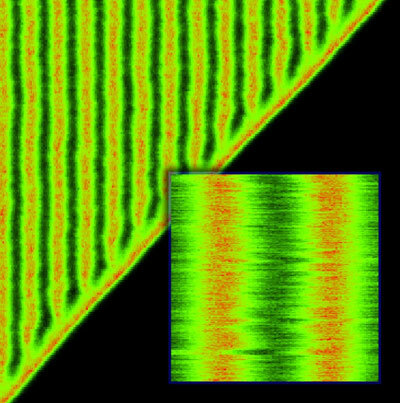 The possibility of forming Turing patterns on nanometer distances opens the door to interesting applications, particularly in the field of surface modification of materials. By skillfully selecting the chemical composition of the reagents and the conditions in which the reaction occurs, it could be possible to form Turing patterns in two dimensions (on the same surface of the material), or three (also in the space adjacent to the surface). The formed patterns could then be fixed, e.g. by photopolymerisation, thereby obtaining a permanent, stable, extended surface with a complex, periodic structure.